﻿ Join Us in a Marketing Wonderland on November 1st » Red Mango Marketing! What happens when the U.S. Small Business Administration Tech Coalition brings together Constant Contact, Facebook, Google, and Square? A free, live stream workshop to help small businesses make the most of the holiday season of course. Join us on November 1st, from 12 pm to 2 pm ET, as we share the latest tips and tricks to be found online by holiday shoppers this season. And yes, the experts will be on hand to take your questions live. 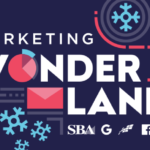 Be sure to register for the Marketing Wonderland and prepare yourself for an afternoon of small business marketing advice designed to make this season your most magical yet. The post Join Us in a Marketing Wonderland on November 1st appeared first on Constant Contact Blogs. This entry was posted on Wednesday, October 18th, 2017 at 8:00 am	and is filed under marketing, News & Updates, Online Marketing. You can follow any responses to this entry through the RSS 2.0 feed. Both comments and pings are currently closed.